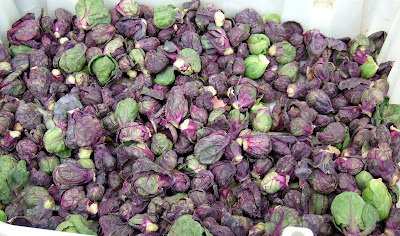 These sprouts are made with ginkgo nuts I harvested from the sidewalk in front of my building. I just cannot begin to tell you how long I have wanted to do this. Every year in late November, the ginkgo trees on my block shed pounds and pounds of edible and healthful nuts. The ginkgo nuts lie trodden underfoot because nobody knows what to do with them. The pulp of the outer hulls becomes very pungent as the nuts ripen and some folks just don’t care for that at all, but the nuts themselves do not have any unpleasant odor. For years now I have promised myself that I would one day prepare some home-gathered ginkgo nuts, but I had always let the season go by because I had no idea what to do with them, and I didn’t really feel like picking them up. They are pretty revolting. Two things made this year different. 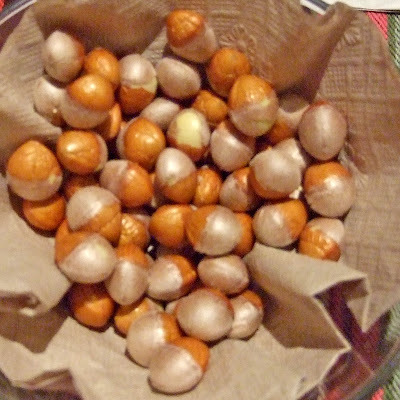 The first was my encouraging success with dried chestnuts, a nut similar to ginkgos, which made me eager to try other nutty vegetable dishes. The second was my heartbreaking failure to do anything with some home-gathered black walnuts, which made me eager to vindicate myself with some local foraging, something we don’t get to do too often here in lower Manhattan. It turns out that ginkgo nuts are not at all difficult to gather and prepare, if you are willing to devote a little time to them. Try to select newly-fallen nuts with unbruised outer husks. Serious ginkgo gatherers do this by spreading a drop-cloth on the ground and then shaking the tree. I picked my nuts from the hoods and roofs of parked cars, figuring that because of New York’s alternate side of the street parking regulations, they could not have been undisturbed for long. You may want to wear protective gloves (I did not). As soon as you get home, submerge the nuts in cold water and rub off the husks. This is not difficult at all. Allow the nuts to dry. 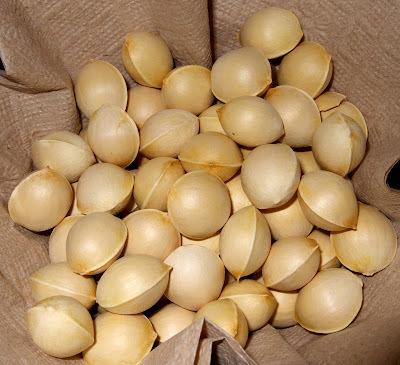 Ginkgo nuts in the shell will stay fresh for months. See how pretty they are? Not the least bit objectionable. When you are ready to use the nuts, crack open and remove the shells. 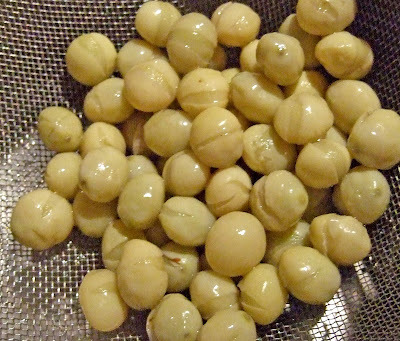 Put the nuts in a saucepan with water to cover and boil for about forty-five minutes, or until they are tender. The brown skins will come off easily once the ginkgo nuts are cooked. You can now use them in any recipe that calls for cooked or canned ginkgo nuts. Trim, clean, and examine the sprouts. Heat oil in a wide skillet. 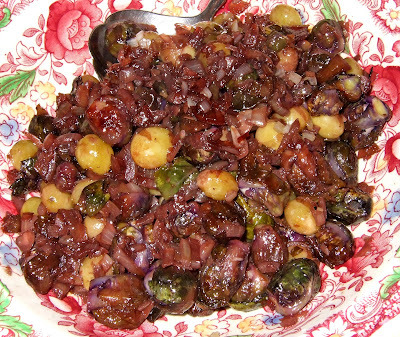 Add sprouts and ginkgo nuts and cook for several minutes, until a bit golden. Add the diced shallots and cook several minutes more until soft and translucent. Add about ¾ cup red wine and a bit of sugar and salt to taste and continue cooking until the liquid is almost all absorbed. This was delicious and very satisfying. The nuts have a pleasant, almost dumpling-like richness that goes very nicely with greens. They are gluten-free, and I bet they would be a very useful ingredient to have around during peysekh, which I hardly need remind you is hurtling towards us like professor Walter Lewin on that pendulum-aparatus. I will have to remember to gather lots more next year. never seen the ginko nuts before, I am wondering if they exhist in the UK, I normally justy heard of them in pills for students to help you concentrate?? Oh and in shampoo I guess it makes sense! Never seen this before. Interesting! Happy New Year. Wishing you all the best! Ikh hob dos geshikt tsu mayn geygnt blits-briv reshime, vos firt on itster mit a brenendike diskusiye veygn opshneydne tsvey froyns-bild ginko beymer in undzer park! efsher vet es aynredn zey vos hobn zikh baklogt veygn dem reyikh!